Zedekiah was twenty-one years old when he began to reign; he reigned eleven years in Jerusalem. His mother’s name was Hamutal daughter of Jeremiah of Libnah. 2 He did what was evil in the sight of the LORD, just as Jehoiakim had done. 3 Indeed, Jerusalem and Judah so angered the LORD that he expelled them from his presence. Zedekiah rebelled against the king of Babylon. 4 And in the ninth year of his reign, in the tenth month, on the tenth day of the month, King Nebuchadrezzar of Babylon came with all his army against Jerusalem, and they laid siege to it; they built siegeworks against it all around. 5 So the city was besieged until the eleventh year of King Zedekiah. 6 On the ninth day of the fourth month the famine became so severe in the city that there was no food for the people of the land. 7 Then a breach was made in the city wall; and all the soldiers fled and went out from the city by night by the way of the gate between the two walls, by the king’s garden, though the Chaldeans were all around the city. They went in the direction of the Arabah. 8 But the army of the Chaldeans pursued the king, and overtook Zedekiah in the plains of Jericho; and all his army was scattered, deserting him. 9 Then they captured the king, and brought him up to the king of Babylon at Riblah in the land of Hamath, and he passed sentence on him. 10 The king of Babylon killed the sons of Zedekiah before his eyes, and also killed all the officers of Judah at Riblah. 11 He put out the eyes of Zedekiah, and bound him in fetters, and the king of Babylon took him to Babylon, and put him in prison until the day of his death. 12 In the fifth month, on the tenth day of the month– which was the nineteenth year of King Nebuchadrezzar, king of Babylon– Nebuzaradan the captain of the bodyguard who served the king of Babylon, entered Jerusalem. 13 He burned the house of the LORD, the king’s house, and all the houses of Jerusalem; every great house he burned down. 14 All the army of the Chaldeans, who were with the captain of the guard, broke down all the walls around Jerusalem. 15 Nebuzaradan the captain of the guard carried into exile some of the poorest of the people and the rest of the people who were left in the city and the deserters who had defected to the king of Babylon, together with the rest of the artisans. 16 But Nebuzaradan the captain of the guard left some of the poorest people of the land to be vinedressers and tillers of the soil. 17 The pillars of bronze that were in the house of the LORD, and the stands and the bronze sea that were in the house of the LORD, the Chaldeans broke in pieces, and carried all the bronze to Babylon. 18 They took away the pots, the shovels, the snuffers, the basins, the ladles, and all the vessels of bronze used in the temple service. 19 The captain of the guard took away the small bowls also, the firepans, the basins, the pots, the lampstands, the ladles, and the bowls for libation, both those of gold and those of silver. 20 As for the two pillars, the one sea, the twelve bronze bulls that were under the sea, and the stands, which King Solomon had made for the house of the LORD, the bronze of all these vessels was beyond weighing. 21 As for the pillars, the height of the one pillar was eighteen cubits, its circumference was twelve cubits; it was hollow and its thickness was four fingers. 22 Upon it was a capital of bronze; the height of the one capital was five cubits; latticework and pomegranates, all of bronze, encircled the top of the capital. And the second pillar had the same, with pomegranates. 23 There were ninety-six pomegranates on the sides; all the pomegranates encircling the latticework numbered one hundred. 24 The captain of the guard took the chief priest Seraiah, the second priest Zephaniah, and the three guardians of the threshold; 25 and from the city he took an officer who had been in command of the soldiers, and seven men of the king’s council who were found in the city; the secretary of the commander of the army who mustered the people of the land; and sixty men of the people of the land who were found inside the city. 26 Then Nebuzaradan the captain of the guard took them, and brought them to the king of Babylon at Riblah. 27 And the king of Babylon struck them down, and put them to death at Riblah in the land of Hamath. So Judah went into exile out of its land. 28 This is the number of the people whom Nebuchadrezzar took into exile: in the seventh year, three thousand twenty-three Judeans; 29 in the eighteenth year of Nebuchadrezzar he took into exile from Jerusalem eight hundred thirty-two persons; 30 in the twenty-third year of Nebuchadrezzar, Nebuzaradan the captain of the guard took into exile of the Judeans seven hundred forty-five persons; all the persons were four thousand six hundred. 31 In the thirty-seventh year of the exile of King Jehoiachin of Judah, in the twelfth month, on the twenty-fifth day of the month, King Evil-merodach of Babylon, in the year he began to reign, showed favor to King Jehoiachin of Judah and brought him out of prison; 32 he spoke kindly to him, and gave him a seat above the seats of the other kings who were with him in Babylon. 33 So Jehoiachin put aside his prison clothes, and every day of his life he dined regularly at the king’s table. 34 For his allowance, a regular daily allowance was given him by the king of Babylon, as long as he lived, up to the day of his death. In its own strange way the book of Jeremiah as we have it today comes to an end. In an almost words for word parallel of 2 Kings24:18-25:30 , with the addition of the comments about the number of people deported in verses 28-30 and the omission of the appointment and execution of Gedeliah in 2 Kings 25:22-26 (which is dealt with at length in Jeremiah 40-41). There is a tradition that the Book of Kings (which we divide into 1 & 2 Kings) and the Book of Jeremiah both originate with Jeremiah and do share a similar theological judgment to explain why the Kingdoms of Israel and Judah collapsed, but regardless of who composed or edited each work the ending of 2 Kings and Jeremiah almost certainly share a common source. So why end here, even going back and retelling once more in a short summary narrative the collapse of Jerusalem. The book of Jeremiah attempts to make sense of the what seems senseless, the ending of the world as the people of Judah and Jerusalem knew it in the emergence of the Babylonian empire and the conquering multiple times and eventual decimation of the land, the city, the people, the temple and all the markers that made them who they are. The pride of the people is shattered, the riches of the temple are cut up and carried off, the items that the false prophet Hananiah said would be returned in Jeremiah 28 are not only not returned but everything else is carried off. So much time is spent dwelling on the vessels of the temple which are carried away perhaps to catalog the way things were for some future day when they can be reclaimed, but the volume of description for the vessels and articles of the temple vastly outweigh the sparcity of the description of those taken into exile. Those who go into exile is another puzzling feature. The decimation of Judah and Jerusalem must have led to many, many deaths by war, starvation and pestilence (as we heard echoed throughout the book) and certainly seventy four Judeans, many if not all bearing specific titles or ranks, who were executed is an act which created horror among the people as well as the arrest, blinding and public shaming of Zedekiah, would have created a trauma among many of the people, but to look at the numbers talked about in the deportation(a total of 4,600 people and only 832 in the deportation of the story immediately providing context) seems like a very small part of the Judean population or even the population of Jerusalem. The Babylonian exile is one of the defining events of the Jewish identity and yet the numbers don’t seem to match the impact or the number of people that would become dispersed in the diaspora. It is from those who are deported and go into exile in Babylon that the future will come out of, and yet to me this number seems smaller than I had expected to see. The story does end on a small note of hope, Jehoiachin the first king deported is eventually shown favor and perhaps there is an entry of hope for the rest of those in captivity in Babylon. Perhaps the people who heeded Jeremiah’s plea to settle in the land where they find themselves allows for the birth of a new hope and a new beginning. It is during this time that many of the writings of the Hebrew Bible will be compiled and collected and brought together to be used to continue to form the identity of this people now in exile in a foreign land. So my long journey with the book that bears Jeremiah’s name comes to an end. It has been at times a challenging journey and it means walking through the depression and questions that come with the ending of all the things that once defined a people. The very things that occupy space in this last chapter, the humiliation and imprisonment of the Davidic king, the loss of the land and the city of Jerusalem, the loss of the temple built under Solomon no longer provide identity and meaning for the people and now as they go into exile they have to find a new way to construct their identity as the chosen people of the LORD. 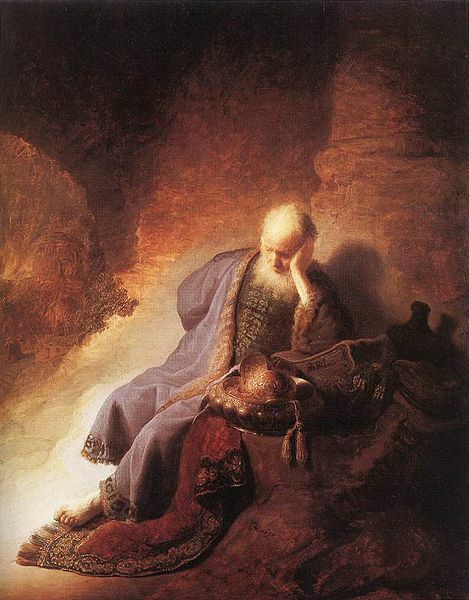 The anguished cries of Jeremiah are a part of that process of reconstruction as are the process of collecting together the stories and memories of the kingdoms of Israel and Judah. For the people to understand who they are going forward it appears they first have to look back into the past and evaluating their story theologically determine what went wrong in the past to make a way for a new future after the exile.